Millitech E-Band Polarizer customizable for bands ranging from 18 to 110+ GHz. Featuring a low axial ratio of < 0.6 dB, low insertion loss of < 0.5 dB, and a typical VSWR of 1.25:1 within the high and low unlicensed communication bands of 71 – 86 GHz, Millitech ultra-wide bandwidth E-Band Linear-circular Polarizer enables designers to achieve dual circular-polarized E-band systems with exceptional cross-pol discrimination. Measuring 1-inch in length, device can be easily integrated with the Millitech product line that leverage the 0.125” circular waveguide. 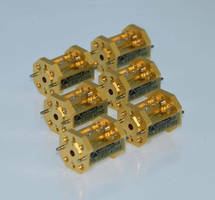 Northampton, MA — Smiths Microwave Subsystems has announced that its brand, Millitech, has released an ultra-wide bandwidth E-Band Linear-circular Polarizer boasting a low axial ratio of < 0.6 dB, low insertion loss of < 0.5 dB, and a typical VSWR of 1.25:1 within the high and low unlicensed communication bands of 71 – 86 GHz. With over two times the bandwidth of similar products and an industry leading axial ratio performance, this polarizer enables antenna system designers to achieve dual circular-polarized E-band systems with exceptional cross-pol discrimination. It measures 1- inch in length and can be easily integrated with the Millitech product line that leverage the 0.125” circular waveguide. These devices can also be easily customized for other bands from 18 to 110+ GHz. Standard models in other common bands are on the horizon. A video recently released demonstrates the performance of the polarizer over the entire E-band frequency. Millitech, Inc. specializes in the design, engineering and manufacturing of millimeter-wave components, assemblies, subsystems and fully integrated systems for applications in satellite communications, radiometry, radar and remote sensing. For over 30 years our engineering, manufacturing and sales staffs have been dedicated to providing the most technically advanced millimeter-wave products and services available, enabling our customers to translate their ideas and needs into cost-effective solutions. Circular Polarizer Filter offers low birefringence. Polarization Modulator enables single-lens HD 3D projection.